Considering Teeth Cleaning in Bastrop? Convenient Location in Bastrop Serving all of central Texas, we are located off Hwy 71 at the intersection of Hunters Crossing Blvd. and Home Depot Blvd. Are You a Candidate for a Teeth Cleaning in Bastrop, TX? If it has been more than six months since you have had your teeth professionally cleaned, you are due for a cleaning. It is recommended that if you don’t have any dental problems, you get examined by a dentist and have a professional cleaning every six months. If you are having problems, you need to be seen as soon as possible. A routine dental visit includes a thorough examination along with a professional cleaning. During the cleaning we remove the buildup including plaque and tartar that is on your teeth. We also clean underneath your gums, where you can’t reach with routine brushing at home! This is necessary to prevent dental disease. 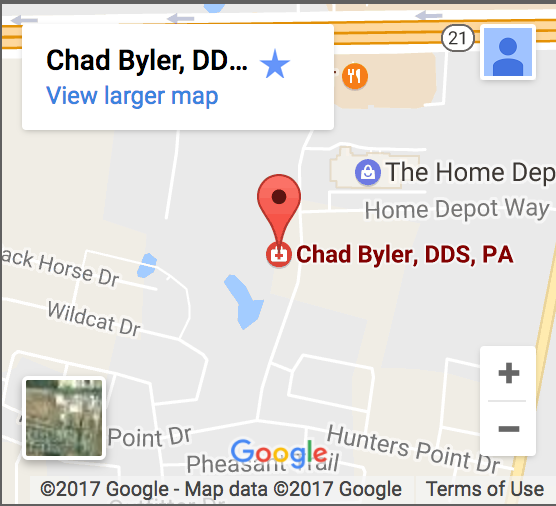 To learn more about an examination and teeth cleaning, schedule a consultation with Dr. Byler in Bastrop, Texas. When we do a thorough teeth cleaning, we scale off any buildup of plaque and tartar that is on your teeth. We also clean underneath your gums to make sure that your teeth are as clean as possible. After the cleaning, we will polish your teeth so that they shine! Sometimes we will also apply fluoride to your teeth. During your appointment we perform a thorough examination to make sure your mouth is healthy. We look for problems in order to catch them early. We also look at any artificial teeth you have to make sure they are holding up. Also during your appointment, we go over home care to make sure you are doing everything you can to keep your mouth healthy. Call (512) 308-9860 to schedule a dental cleaning in Bastrop, TX today!